"I do television so I can do New York." He was apparently again, referring to Hell’s Kitchen, the reality TV show (and totally manic scream-a-thon) he introduced to an American audience. "Basically, I’m a prostitute," he continued, "I prostitute myself so I can have a restaurant here. But I don’t fully take off my knickers." That would probably explain a whole lot, methinks. 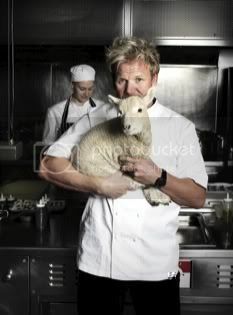 In any event, read more on Chef Gordon Ramsay’s softer side here. 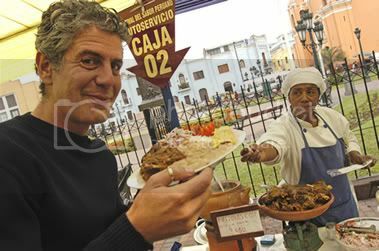 And yes, as always, Bourdain pretty much rips ‘em each a "brand new one," while apparently taking it a bit easy on down-home girl, Paula Deen, when referring to her as a seemingly "nice old lady." (Can’t you just see America’s favorite Georgia Peach, rolling her ample neck, and eyes, chanting, "Uh, uh, baby -- oh no, you didn’t!") But then, going on to refer to her as a look-alike for the late cult icon, Divine... Well, Ouch! I actually WATCH Food Network now and again, more often than not drawn in by the progressive horrors on screen. I find myself riveted by its awfulness, like watching a multi-car accident in slow motion. Mesmerized at the ascent of the Ready-Made bobblehead personalities, and the not-so-subtle shunting aside of the Old School chefs, I find myself de-constructing the not-terrible shows, imagining behind the scenes struggles and frustrations, and obsessing unhealthily on the Truly Awful ones. Screaming out loud at Sandra Lee in disbelief as she massacres another dish, then sits grinning, her face stretched into a terrifying rictus of faux cheer for the final triumphant presentation. I mourn for Mario..and Alton...Bobby and yes--even Emeril, nobly holding the fort while the TV empire he helped build crumbles like undercooked Bundt cake into a goo of Cheez Wiz around him. And no doubt, I, for one, will never get tired of hearing what this super-talented chef and consummate "wordsmith" has to say -- as only *he* can say it. Share Our Strength and WineStyles, the nation's largest wine store franchise, have announced a national cause-related marketing partnership that will raise funds for the fight against childhood hunger. Learn more here about this ultra-worthy endeavor in the ongoing effort to feed our children. I think it’s now pretty clear that, well, hell...her detractors can say whatever it is they want. Still, the perky, young culinary "machine" known as Ms. Rachael Ray, will continue to flip it off, and laugh about it all the way to her nearest bank -- with *mucho dinero* to deposit there, no doubt. 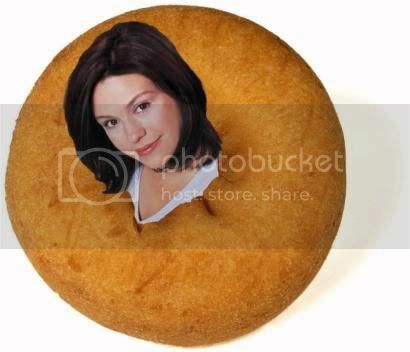 And now, in addition to her ABC syndicated talk show, her omnipresence on the Food Network Channel, her role as a prolific cookbook author and recent gig as pitch woman for Nabisco , Rachael is now also the pitch woman for Dunkin Donuts . So since I guess we’ve all established by now...that she’s not a chef (Rachael herself has even confirmed this), no one can argue, that she’s a mega, multi media force to be reckoned with. Therefore, simply try (if you can) to "get over it" when it comes to her pet phrases such as Yum-O and E.V.O.O., which seem to drive some folks up the proverbial wall -- although I’ll never really understand why. She’s just being Rachael Ray, guys. And clearly, I’ve never seen any evidence up till now, that she ever pretended to be anyone else. With the constant rise of today’s chefs reaching near rock star status -- does anyone truly realize the amount of pressure brewing from moment to moment most up-and-coming chefs actually face behind the scenes in the average restaurant kitchen? Well, that's the question PBS will attempt to explore in the brand-new prime-time reality series Cooking Under Fire premiering Wednesday, April 27th. In this Reality TV/documentary series, 12 contestants will be tracked as they embark on a coast-to-coast cooking competition in four of the nation's culinary capitals --Los Angeles, Las Vegas, Miami, and New York. The show will share an insider's look at the mental and physical challenges and intense pressures faced in the today's highly competitive restaurant industry, and the combination of talent and skills that it really takes to succeed. It's also being solidly touted as: "Reality TV — the way only PBS can do it." Um...Okay. In any event, the contestants will be judged by celebrity super chefs Ming Tsai, Todd English, and Michael Ruhlman author of The Soul of a Chef,The Making of a Chef , as well as an impressive panel of local guest chef judges -- as they face cooking challenges, difficult deadlines, and the heated pressure of working against the clock. Those who can’t stand the heat will, of course, be taken off the competition menu and sent packing. And, of course, the lone contestant left standing, will win the ultimate prize -- a chef position at one of restaurateur Todd English's New York City restaurants. A kinder, gentler, Fox Network’s Hell’s Kitchen with a lighter twist, perhaps? We’ll see. Check local listings – and tune in. Check out what else he has to say about Pinot Noir in this month’s issue of Food and Wine . 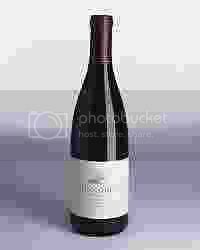 Also: For the best food pairings with this wonderful wine, be sure to go to www.foodandwine.com/pinot to find a listing of Pinot-friendly recipes. And trust me on the Stir-Fry Peking Lamb With Peppers and Green Beans . I tried it this past Sunday...to some rave reviews.